The wind was down today so I was able to get out! The last two days had strong westerly’s! The tide was high as well,so I already knew that the number of bears out & about would be reduced considerably! Having said that,I did come across three! A Sow/cub (Maw & Chubby),& a single adult! I found “Maw” & “Chubby” in Fortune Channel & that other single bear in Gunner Inlet. The sun has shifted much further south! When I left Fortune Channel to go over into Gunner Inlet,I could clearly see several klicks away that it was already in shade! There is a ridge to the SW of Gunner that is now blocking the light when the sun gets low! I’ll have to go into Gunner first from now on. I returned into the harbour for sunset & noticed that there were few clouds for the sunset. I went to Deadman Island to visit with Romeo & was surprised to find Juliette!! She & Romeo did fly over to greet me! however,that was it for Juliette’s greetings for the night. She just sat in the tree watching Romeo & I. Spent some quality time with them both at any rate! The sun set & said goodnight to them both. The “Pacific Spray” was heading out to do a harvest. It’s the harvest boat used by “Mainstream” at their fish farms. This is a fish farm harvest boat. They were heading out to one of their farms to harvest the Atlantic salmon they grow. I think this boats name is the “Pacific Spray”? I normally do not get up early and go out at sunrise,but the moon was setting and I thought I’d go down to the harbour to see what I could see? The moons path was too far north to go out to the beach. I would not be able to line up the moon with the Lighthouse. The Pacific Spray is the harvest boat for Mainstream. 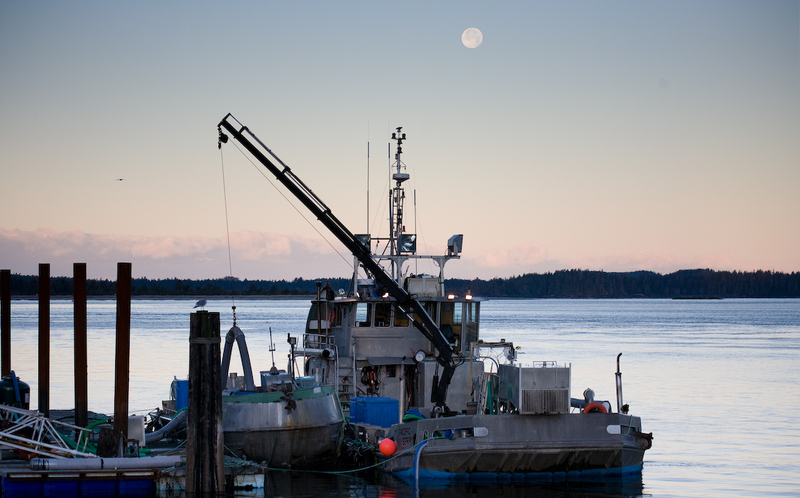 They are one of two fish farming companys in Tofino.